Given the choice between Nutella and a real relationship, I would probably choose the former. 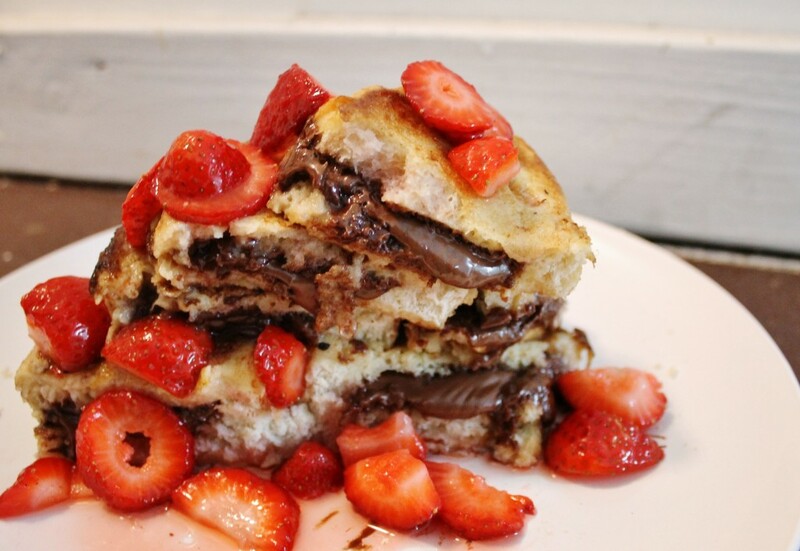 Nutella just makes everything infinitely better. Waffles are bland, fluffy, glutinous objects without it. Crepes are blasphemous without it. And you have been wasting your time if you’ve been eating your peanut butter & banana sandwiches without this delicious, chocolatey spread. Not usually one for French toast, I’ve lately been in the mood to French toast-ify just about everything. Pancakes? Sure, why not! Pumpkin bread? How seasonal! 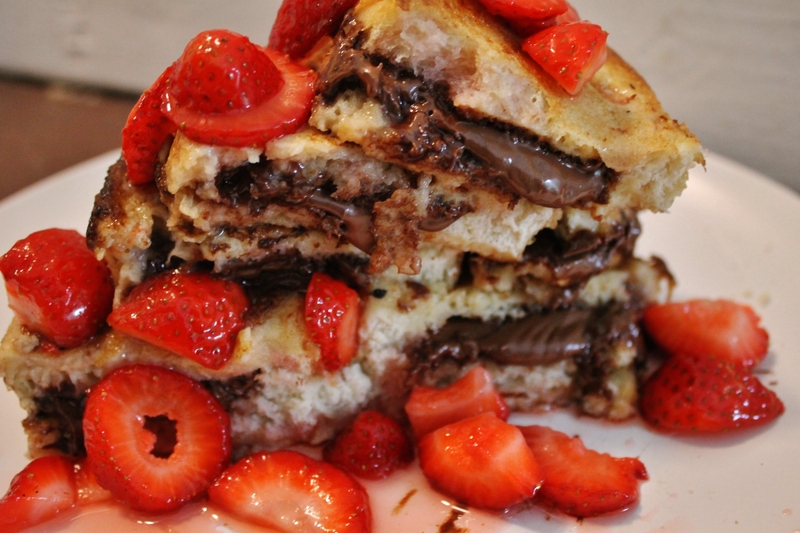 This Nutella-stuffed French toast is the brainchild of these two culinary interests. 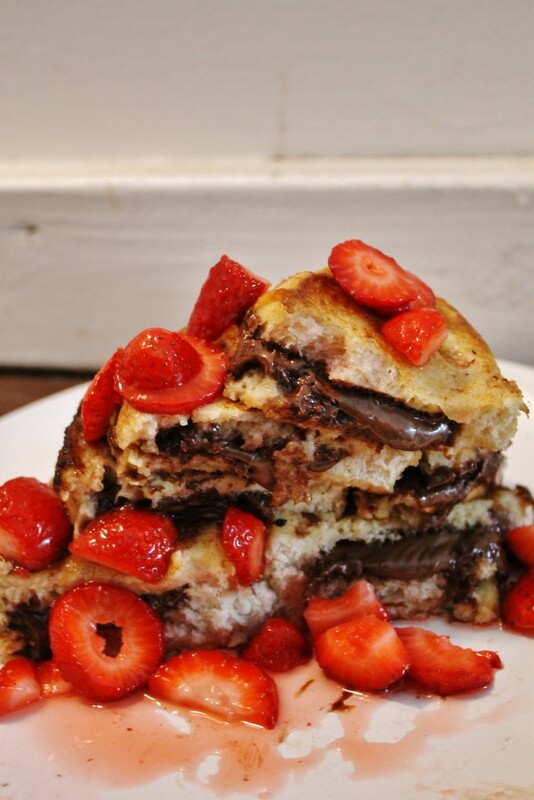 Perfectly eggy-soft on the outside, warm chocolately-goodness on the inside. Aaaaand throw in some macerated strawberries. Because who doesn’t love those? In a medium bowl, combine the strawberries and sugar, stirring well. Cover with cling wrap and set aside for at least one hour or up to overnight. Beat together the eggs, milk, and vanilla. Whisk in the flour, sugar, and cinnamon, making sure to get every little lump out. Slice up your loaf of bread into about 8-10 thick slices (think: each slice should be about the size of two or three regular slices). Butterfly each individual slice 3/4 of the way, then slather a thick layer of Nutella in the opening. Dunk each piece of bread in the egg mixture evenly, then fry on a hot greased pan until golden brown on each side. Serve warm with a heaping spoonful of the macerated strawberries over top and diiiiive in. Yep. 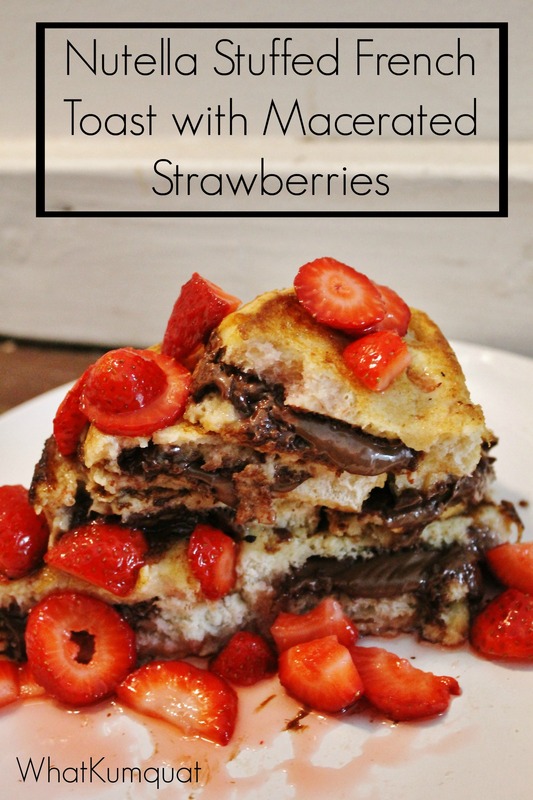 I’m totally drooling over this breakfast because you’ve combined two of my favorite things: Nutella and Strawberries… and then put them with breakfast carbs, which are the BEST kind of carbs. Pinning this so we can whip this up at my house in the near future — nice work! Wow. This looks fantastic. My kids would go crazy for this…if I haven’t eaten it all first. what the what. WHAT THE WHAT?!?! Strawberry and Nutella are SO amazing together! Love these, they’d make the perfect weekend breakfast treat! Holy deliciousness, these look dangerously good!